THERE were, of course, many books on “business” when Concept of the Corporation was written in the last years of World War II after I had finished eighteen months of research and study of the General Motors Corporation which had begun in January 1943. In fact, it was the first book that looked upon a “business” as an “organization” that is, as a social structure that brings together human beings in order to satisfy economic needs and wants of a community. And it was altogether the very first book that looked at “management” as a specific organ doing a specific kind of work and having specific responsibilities. In fact, no one, since I wrote this book almost fifty years ago, has tried to do something similar—whether with another big business enterprise or with any other of the big organizations in and through which the social tasks of modern society are being discharged, whether hospital, school, university, or church. Concept of the Corporation is credited with having established management as a discipline and as a field of study. I have always felt that it also did something even more important: it established organization as a distinct entity, and its study as a discipline. Traditional sociology does not know of “organization”; it knows society and community. Organization is neither, though it has elements of both. The book of mine that preceded Concept of the Corporation, The Future of Industrial Man (also to be reissued by Transaction) concluded that industrial society needed an organ that while distinct and sui generis (unique) gave status and function, that is an organ that embodies the main characteristics of traditional community and traditional society. That book led to the invitation from General Motors to study from the inside the company, its organization, its management. And Concept of the Corporation thus became the first attempt to show how an organization really works and what its challenges, problems, principles are. Few, if any, of the things the book discusses had ever been discussed before. Of course we knew about labor relations—after all the automobile industry had been unionized in 1937, only a few years before Concept of the Corporation was written. And I spent a good deal of time during my eighteen months of study with leaders of the United Automobile Workers Union, and especially with their dynamic president Walter Reuther whose friendship I then enjoyed until his untimely death in 1970—just as I enjoyed the friendship of his General Motors counterpart, Charles E. Wilson until his death in 1961. This book sees them as relations between the individual worker and the organization, between the individual worker and his or her work, between people working together—and that was new and unprecedented. But it was the way people inside General Motors, whether management people or workers, saw labor relations; it was what one perceived when looking as an outsider but from the inside. And the same holds true for all the other topics discussed in the book. Of course most of these topics are familiar today. 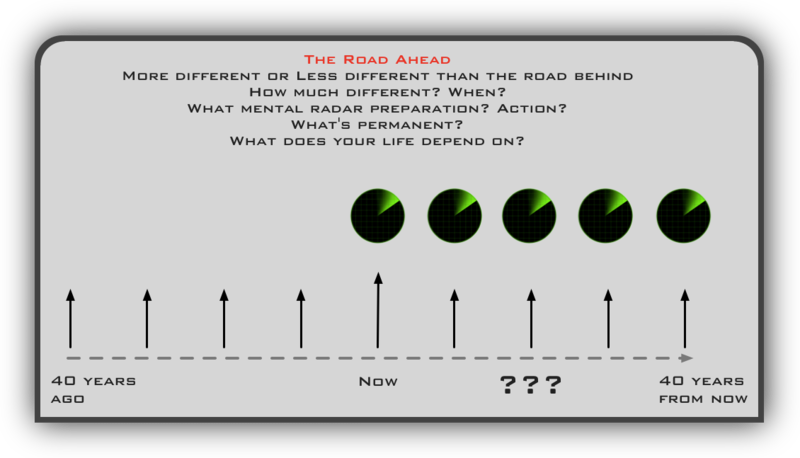 But the problems they raise, the questions they ask, the opportunities they offer, are still the same for the large organization—whether business or nonprofit. In fact they are perhaps most critical for the labor union itself—and no labor union, at least not in the United States, has yet tackled them either purposefully or successfully. And while General Motors was and is a manufacturing company, these questions apply just as much to service businesses. They are the questions that are characteristic of this new social phenomenon, the organization. And so this book might best be read today not as a book about General Motors, about manufacturing business, or about business altogether, but as a book about the large-scale organization. In the 1983 epilogue to this book—it is included in this reissue—I recounted the frosty, if not hostile, reaction the book received from many General Motors people. And a main reason, I now realize, was precisely that I treated General Motors as a prototype, as an “organization,” and its problems therefore as problems of structure, if not of principle, rather than as the way General Motors does things. Still, this is a book about General Motors. And the General Motors of 1993 looks very different from the General Motors of 1946 or even from the General Motors of 1983 when last I wrote a foreword and an epilogue to a reissue of this book. The 1983 epilogue already reported on a company in trouble—though the General Motors executives of that time, ten years ago, did not yet perceive this, let alone admit it. But the 1983 epilogue has been proven right in its prediction that, ten years later, that is in the 1990s General Motors would still be on the defensive. But I also expressed the hope that General Motors might by the nineties have returned to profitability—and needless to say, that has not happened. And the reasons for General Motors’s fumbling and inability to pull itself out of the mire, are largely the problems Concept of the Corporation pointed out fifty years ago—for which act of high treason I then became a “nonperson” for most of General Motors’s top management. By now everybody at General Motors knows that these are the crucial problems. And yet General Motors does not seem able to resolve them. Acting on the oldest delusion of managements: “if you can’t run your own business buy one of which you know nothing,” General Motors has bought first Electronic Data Systems and then Hughes Aircraft. Predictably this will not solve General Motors’s problems. Only becoming again a truly effective automobile manufacturer can do that. But General Motors shows how hard it is to overcome fifty years of success, how hard it is to break a monopoly mindset. The example of another American industrial success story, the Bell Telephone System, shows that only catastrophe (in the Bell case, the breakup of the company through an antitrust judgment) will do it. I am increasingly coming to ask whether anything short of a General Motors breakup, either voluntarily or through a hostile takeover, is likely to enable General Motors (or its successors) to make a successful turnaround. Concept of the Corporation was first published in 1946, almost forty years ago. But it has not become a “classic”—that is, a book of which everybody knows but which no one reads. It keeps on selling, and in such numbers that one or two new editions have had to be published every decade—this latest one is the sixth edition. Clearly the book has something important to say to today’s readers, but surely it is something quite different from what it told its first readers forty years ago. Books on the corporation itself and on its management could have been counted on the fingers of one hand. And “management” as a discipline and as an object of study did not exist at all. When this book first appeared reviewers did not know what to make of it. And another friend, the president of the college where I then taught, argued strongly against my publishing the book at all. “You are well launched on an academic career either in political science or in economics,” he said. When this book was written, General Motors, the company I used as the exemplar of the modem corporation and of modem organization altogether, was at the very pinnacle of success. It had been the star performer in the American production achievement of World War II and was getting ready for an even more triumphant performance in the postwar economy, in the course of which it more than doubled its output and more than quadrupled its profits. Today dozens of books on every aspect of the corporation and its management are being published every year. My old friend the college president was indeed right: neither political scientists nor economists have yet accepted the reality of modem organization of which Concept of the Corporation was the first analysis. Instead this book created a new discipline: we call it “Management”—the organized, systematic study of the structure, the policies, and the social and human concerns of modem organization. Management has since become a popular field of professional and graduate studies throughout the world. Business schools—many of them renamed “School of Management”—are absorbing schools of public administration or schools of hospital management; the Harvard Business School offers “management programs” for college presidents. Most of the “executive management programs” recruit and enroll mid-career executives from both businesses and non-business institutions, from the Federal government to professional associations. And the most popular course in a good many Schools of Theology is a course in “Pastoral Management,” with Concept of the Corporation often the basic text. When General de Gaulle, to emulate Napoleon, decided to create a new Grande Ecole that would outrank his great predecessor’s creations and form France’s future rulers, he founded an Ecole National d’Administration, a postgraduate management school, with a curriculum modeled after the American school of management. 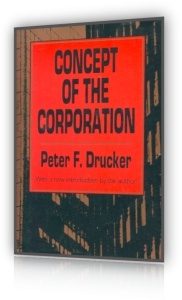 The first book assigned to the entering students was Concept of the Corporation. In sharp contrast to forty years ago, the automobile industry is today in deep crisis worldwide—a crisis accelerated by the energy crisis and OPEC but by no means caused by them. For the last twenty years, automobile demand in all Western countries has been growing less fast than the gross national product or personal income. And five years ago, in the late seventies, growth in automobile demand stopped in Japan too. This means that the industry is mature if not actually declining. In the 1940’s, the assembly line was still the most advanced manufacturing process, even though this book already was criticizing it as grossly inefficient and as a violation of basic engineering principles. Today the assembly line is as obsolete as the dinosaur and an obstacle to genuine automation. In its technology as well as in its distribution system the automobile industry has become an “old” and largely an “old-fashioned” industry. Technological and industrial leadership, as well as growth dynamics, have shifted to industries that are based on knowledge or on information, such as the pharmaceutical, information processing, or telecommunications industries. And GM itself, while still the world’s largest manufacturing company (and until recently one of its most profitable ones), has clearly been pushed onto the defensive even in its own industry and in its own home country the United States. The greatest changes that have taken place since this book was written, however, have been in society itself. Above all, we in 1983 see society quite differently from the way the generation of 1945 did. We see it very largely the way Concept of the Corporation first saw it. Today we take for granted modern organization. Indeed we know that modem developed society is a society of organizations in which the major social tasks are all being performed in and through institutions, whether they be business corporations or government agencies, hospitals, schools or universities, or the armed services. Forty years ago the business corporation was seen as the new and the exceptional, if it was seen at all. Today it is recognized as one member of a species, with the resemblances among the various members much greater than the differences. All of them require reorganization and structure. In all of them there is a distinct kind of work, the work of management. All of them have policies and strategies. All of them within themselves face the problems of the status and the function of the individual. All have to make resources productive, above all the human resource. All of them have to handle power relationships within and thus require principles of constitutional order. These are the very issues which Concept of the Corporation first identified and described. But what all of the institutions of the modem society of organizations also have in common is that they function and perform within a larger society and community and thus face what we now call “social responsibilities”—again an issue first identified in Concept of the Corporation. Today all this is commonplace. Forty years ago it was so new as to be shocking. Then more than half of all young Americans still ended their formal schooling short of a high school diploma. Today more than half go on to college. Then four fifths of the American labor force still worked in “blue-collar” jobs on the farm, in the factory, in the mine, on the railroad, or in a craftsman’s workshop. Today only about two fifths of the labor force—half the proportion of forty years ago—are blue-collar workers, and by the year 2000 or so the proportion will have shrunk even further, to one quarter or less. Nearly half of all Americans at work in 1945 worked in manufacturing. Today the proportion is one fifth, and by the year 2000 the manufacturing work force will be down to one tenth of the total. Forty years ago the term “knowledge worker” was unknown (I coined it in my book The Landmarks of Tomorrow in 1959). Today knowledge workers (that is, people who get paid for putting to work what one learns in school rather than for their physical strength or their manual skill) constitute more than half of the American labor force. In all developed countries the society of 1983 has become an employee society. The great majority of people in developed countries today work as employees of organizations. This is in sharp contrast to the world which was still taken for granted in the 1940’s, in which the social norm was not employees but people who worked for themselves, as did the farmers, the craftsmen, the lawyers, the physicians, or the small shopkeepers. And it was almost taken for granted forty years ago that people with higher education would work for themselves. No one, neither businesses nor government agencies, had ever heard of college recruiting. Even top management people in large companies rarely had a college degree. General Motors in those days was a curiosity in that most of its top management people had gone to college. But IBM hired its first college-educated engineer only a year or two before the outbreak of World War II. Today nine out of every ten people with advanced schooling go to work for an organization immediately upon graduation and remain employees of an organization all their working lives. Indeed without the modem organization we would have no jobs for college-educated people. The large organization is the only place where we can put advanced education productively to work and pay for it. Conversely the modern organization could not function without people of substantial formal schooling in a wide variety of knowledge areas and disciplines. But also in this employee society, business, and especially big business, is increasingly run for the benefit of the employees rather than, as law and political rhetoric still have it, for the benefit of the shareholders. In the first place the “wage fund”—that is, that part of the national income that goes to employees—now amounts to some 85 percent of total national income (it runs even higher in Europe, to a peak of 96.5 percent in Holland, for instance). By contrast the wage fund a hundred years ago, when the first labor unions issued their manifestos and programs, took less than 40 percent. In the United States this has been accomplished through the mechanism of the pension fund. Of the available business profits—that is, of whatever is left after expenses and taxes—pensions take half or more in most large companies. And since the pension funds in the aggregate are now the owners of about half the share capital of the “Fortune 500” and other large companies, they receive an additional half of the remainder, whether in the form of dividends or in capital appreciation. In other countries the same end has been reached by different means. In Japan for instance the mechanism is “lifetime employment,” which means that, except in bankruptcy, employees have the first call on all income of a business. And in the employee society, access to livelihood, to social status, to recognition, to careers is through a job in an organization. And so is access to property. For increasingly the claim to the pension through the pension fund at the place of employment is the largest single asset any but the very few very rich can hope to amass—including even the independent professionals such as lawyers or physicians. Increasingly it is true that the individual has to have a job to be able to exercise the rights of citizenship and to be accepted as a full member of society. But while we have created an employee society, it is not a workers’ society. The political rhetoric still talks of management and labor, but the representative group in our society, and indeed the true majority, is neither. They are knowledge workers rather than manual blue-collar workers, they are subordinates but in many cases they are also bosses and have subordinates of their own. They see themselves as part of management even though they are fully aware of the tension between their goals and aspirations and those of the employing organization, whether it be a business, a hospital, a university, or a government agency. So far they have no clear identity of their own and no clear political or social personality. This group will represent the true social question of the developed society of organizations. How does it relate to the power structure? When this book was originally written, no one even saw this group. Concept of the Corporation realized that such a group was emerging, but it did not see it as central. Like everyone else then, it saw management and labor. But the new group is of course neither. The emergence of this group as a true majority explains in large part the crisis of traditional politics in all developed countries. This is a group that has no political home as yet. It simply does not fit into any of the political traditions or political conventions. It is in many ways a very conservative group and yet does not fit the conservative stereotypes, whether that of the traditional “landed gentry” or that of the traditional businessman. It is in many ways a very liberal group and yet does not fit any of the liberal stereotypes either, and certainly not those of the New Deal of the 1930’s or of European social democracy. It is a group that is up for grabs politically. It distrusts leaders of the traditional type. And yet it has not yet developed any leadership types of its own. This explains why in all developed countries in the last ten years or so people have come to the top in politics who in traditional terms would have to be considered “political adventurers”—a Jimmy Carter and a Ronald Reagan in the U.S., a Margaret Thatcher in Great Britain (could anything less likely be conceived than the leaders of the British Conservatives being a woman, the daughter of a small shopkeeper and an accountant? ), or a Suzuki in Japan (whose only claim to distinction is that he comes from a long line of hereditary headmen of a fishing village, and whose only qualification for being prime minister was that he never had expressed an opinion on anything save subsidies for the fishermen of his native town). These changes are largely the effects of the emergence of the corporation and of the other institutions that are members of the same species, the modem organization. But of course these developments in turn fundamentally change the environment in which the modern corporation operates both internally and externally. The corporation itself has changed just as much as the society in which it exists and performs. General Motors, the prototype of the modern organization of forty years ago, was—and still is—a single-product company, a company doing business primarily within one country, the U.S., and a manufacturing company. The typical modern corporation is highly diversified, and typically includes among its operations not only manufacturing but also non-manufacturing businesses such as financial and service businesses. Finally it is not primarily a “manufacturing” company and certainly not one that is engaged in mechanical manufacturing as General Motors is. General Motors was—and is—the world’s biggest manufacturing company. Most companies then were too small to use modem organization, modem marketing, modem technology. But the representative business of tomorrow may well not be large. It will be a corporation; it will be professionally managed; and it will have to have structure, organization, policies, and strategies. In other words it will be a member of the same species as GM. But it may well be small rather than big. GM may, so to speak, represent the elephant or the whale among mammals. Tomorrow’s business may be man-sized. Elephant and whale derive their performance capacity very largely from their mass. Man derives it very largely from his brain. With information technology and with manufacturing processes shifting increasingly toward feedback control—that is, toward automation based on information and knowledge—the economics of scale may shift drastically. The optimum size may be the one that gives the greatest adaptability rather than the one that gives the greatest mass. And yet if one had to choose today a business to serve as the model for an analysis of the modem corporation one would probable still choose General Motors. The very features that make GM “old-fashioned” make it the right model. Above all, GM is simple, precisely because it was and is a one-product business, a one-country business, and a manufacturing business in which there are managers and workers but relatively few professionals and knowledge workers. And only the simple can serve as a model, only the simple can be analyzed, can be presented, can be made comprehensible. But also the modem corporation, for all the changes, is very much a child of GM, or rather of the kind of business GM represented in its clearest, most carefully articulated, most thoroughly structured form. GM is still very much a prototype, however much the representative businesses of today have grown beyond the GM model. Above all, the basic patterns of structure and organization we have today are all developments of the patterns GM pioneered and first developed, the patterns first analyzed and described in Concept of the Corporation. The answers we give today to the questions Concept of the Corporation first raised may be quite different. But the questions are still very much the same. Indeed the only one that was not raised in this study of GM done forty years ago was that concerning the impact of the educated, employed middle class, the knowledge workers and their employee society. Otherwise there is practically no question being discussed today—whether internal to the corporation, such as structure, compensation, strategy and policy and so on, or external to it, such as social responsibility—which was not first identified, defined, and discussed in Concept of the Corporation, and in much the same terms in which we still discuss these questions today. Above all, this is still, despite all the books on the corporation and its management which have appeared in the last forty years, the only book that looks at a major business in its totality, and looks at it from the inside. He prepared himself by studying all that had been written on the subject. And so great became his reputation as an expert on China that a publisher gave him a most advantageous contract and a big advance. Thus prepared, he landed in Shanghai one fine morning. He spent a pleasant day calling on some people who had been recommended to him as wise in the ways of the country and he was dined and wined wherever he went. He returned to his hotel late at night, but could not go to sleep. His head almost burst with ideas. Finally, in the false dawn, he got out of bed again to jot down a few of these thoughts. When he rose from his desk twelve hours later, he had a most comprehensive, most beautiful outline; the book was done except for the transcription of his mental shorthand. He only needed a few minor statistics on some unimportant point. That was forty-six years ago; last heard of the young man—now a very old man—was still looking up a few minor details and figures. The subject of this book, the social and political problems of industrial society, is fully as big as China and even less known. My qualifications for writing it are vastly inferior to those of the young man in our story. Hence this study cannot and does not claim to be complete or conclusive. It touches upon far more topics than could be adequately treated within the covers of a short book, or be mastered and understood even by a man much better trained than the author. Yet it does not discuss enough topics to cover the field; and the omissions may well be serious enough to affect the conclusions. The subject is so ambitious as to make the author’s attempts to deal with it appear journalistic; yet the book is not ambitious enough to do justice to the subject. The only excuse the author has is that the alternative to submitting to the public so sketchy an essay would have been to follow the example of our friend in China and postpone writing and publication if not forever, at least for a lifetime. This may well have been the preferable course. But it seems to me that we cannot afford to postpone any further the discussion of the fundamentals of our industrial society. There is no more urgent, no more immediate topic for America—and none which is less known and less discussed. This book does not attempt to give the answers; it hopes only to raise questions. It does not pretend to be the definitive book on the relationship between the big-business corporation and a free industrial society; it is an opening statement in what I hope will be a lively and fruitful debate. My interest in the social and political approach to the problems of an industrial society — as distinct from economics — goes back a considerable time. Nevertheless I would not have been able to work out even this preliminary sketch but for an invitation received in the Fall of 1943. The General Motors Corporation asked me to study and to report on its managerial policies and organization from the standpoint of an outside consultant, in which capacity I served for eighteen months. This invitation not only made possible this study financially; it also made available to me the records and the plants of General Motors as well as the rich experience of its executives. Needless to say the opinions expressed and the conclusions reached in this book are exclusively mine, and do not reflect the opinions and conclusions of General Motors Corporation or of any of its officers. But it would be ungrateful not to admit how much clarity and understanding this book owes to members of General Motors’ management in the central offices in New York and Detroit as well as in the manufacturing divisions. That the end of my investigation means necessarily the end of the close contact with this group which it has been my privilege to enjoy for almost two years, fills me with real regret. I also want to record the great debt this book owes to many other friends—in the government service, in trade unions, in business, who abundantly gave of their knowledge and experience. Concept of the Corporation had an immediate impact on American business, on public service institutions, on government agencies—and none on General Motors! It appeared in early 1946, just when Henry Ford II, still only in his mid-twenties, had taken over a near-bankrupt Ford Motor Company that was even more denuded of management than it was short of cash and weak in market standing and products. As both Henry Ford II and Ernest Breech, the GM-trained executive whom Henry Ford II brought in as his Chairman and Chief Executive Officer, have said and written repeatedly, it was Concept of the Corporation which they took as their text to save and to rebuild their company. A few years later, in 1950, the General Electric Company took Concept of the Corporation as the basic blueprint for its own massive reorganization, which then became the model of organization structure and set off the big “organization boom” of the next twenty years. In the course of this boom practically every large business anywhere in the non-Communist world restructured itself on the concepts of decentralization that GM had pioneered and that Concept of the Corporation first described and analyzed. Almost immediately after its publication, the book also became the text for the restructuring of major state universities: Michigan and Michigan State, Minnesota, Iowa, and others all found their traditional structure totally inadequate to serve an exploding student population when the veterans of World War II streamed in under the G.I. Bill. A few years later, when the United States unified its armed services, the first Secretaries of Defense, James Forrestal and George C. Marshall, both reached for Concept of the Corporation to find in it their organizational guidelines. And so did Cardinal Spellman, at about the same time, when he tried to find new organizational principles for the Archdiocese of New York, which, as he asserted, had outgrown, in both size and complexity, the administrative and organizational lineaments of the world’s oldest organization chart, the Canon Law of the Catholic Church. But Concept of the Corporation was not only even rejected by General Motors; it was studiously ignored by the company. There was nothing personal in this. On the contrary, with few exceptions every GM executive whom I met in the course of my study had been friendly or at least courteous, and willing to give me of his time despite the heavy burden which war production imposed on him. And all of them, without exception, were patient with even the dumbest of my questions. Some of these men became personal friends. And not one of them tried to exert any pressure on me to change anything I had written. GM’s most important executive, Alfred Sloan—Chairman, Chief Executive, and the main-force behind the company’s growth, its policies, and its organizational structure—always went out of his way to be friendly and helpful. After the book was published, he repeatedly called me in to get my opinions on his two favorite projects, the Sloan-Kettering Cancer Research Institute in New York and the Sloan School of Management at MIT. Indeed he offered me the Management Chair at the Sloan School and was quite hurt when I, by then happily settled at the Graduate Business School of New York University, turned him down. Yet, the book itself was totally unacceptable to most GM executives, and above all to Alfred Sloan himself. Indeed, as he told me a good many times, my book made him sit down and write his own book on General Motors, My Years with General Motors (New York: Doubleday, 1964), primarily to refute Concept of the Corporation and to lay down what a book on GM should really be and should really focus on. Even though Concept of the Corporation was then the only book on General Motors, it is not even mentioned in Sloan’s work. And this treatment of it as a “nonbook” was by and large the standard reaction of GM and of its executives. The book was not distributed within GM, was rarely, if ever, mentioned, and could not be found on the bookshelves in the offices of GM executives. And when General Motors Institute, the company-owned, company-run engineering school which was the apple of Alfred Sloan’s eye, started to teach management a few years after Concept of the Corporation appeared, the book was not on its reading list and indeed, I was told, was not even to be found in the catalogue of the Institute’s library. The first major objection to Concept of the Corporation on the part of most GM executives—in some cases amounting to outrage—was to the book’s repeated recommendation that GM policies should be thought through before they were returned to unchanged at the end of World War II, when GM would resume peacetime production. They considered this “subversive,” apart from being perfectly silly. More reviewers of Concept of the Corporation—and most readers outside of GM—considered the book to be strongly pro-GM and certainly pro-business. But this view was not shared by GM executives. Their view was best expressed perhaps by one of the company’s elder statesmen, Marvin Coyle, then head of its largest division, Chevrolet, and just about to retire. What upset Coyle and his colleagues even more than the manuscript itself was a letter that accompanied the manuscript when I sent it to him and to the other GM executives for their comments before sending it to the printer. In this letter I first said that it would seem to me that policies that are twenty years old, as GM’s policies were at that time, can always be assumed to have become obsolete and to require new thinking. Few policies designed by human beings, I pointed out, are likely to still be valid after a quarter century or so. In particular I raised the question of whether GM should not seriously consider, in reconverting from defense production to peacetime production, spinning off Chevrolet and making it into a separate company. In the late thirties GM had been subjected to an antitrust suit which, while itself fairly minor, left deep psychological scars. GM’s management became determined not to expose itself to another such traumatic experience. To avoid it, it decided not to permit the company to have more than 50 percent of the American automobile market—that is, not to allow the company to grow beyond the market share it already held. This, however, as some of the younger GM executives had pointed out, meant that GM, already by far the biggest and strongest of American automobile manufacturers, could no longer act. It had voluntarily debarred itself from taking any initiative and could only react. Chevrolet, by itself half of General Motors and larger than any competitor, whether Ford or Chrysler, would, these younger executives had pointed out, be one of the country’s largest businesses and perfectly capable of surviving on its own, in both the passenger car and the truck business. Making it an independent company with the shares distributed to GM’s shareholders would give both Chevrolet and the remaining GM corporation freedom to attack, to innovate, to compete. I did not endorse this proposal—I did not feel competent to do so. But I urged strongly that it be taken seriously—and that was high treason, and not only in the eyes of the head of Chevrolet. But also both in the manuscript and in my accompanying letter, I urged serious reconsideration of a number of other GM policies, precisely because they had been successful for twenty years; policies on dealer relations, on customer relations, on supplier relations, in respect to the first-line supervisor, on employee relations, and so on. I did not argue that these policies needed to be changed—I had no grounds for doing so. I argued only that a policy, any policy, tends to outlive itself after twenty years and that the reconversion of the company to peacetime production, after four years of total dedication to defense work, gave GM an exceptional and probably never recurring opportunity for fresh thinking. It was not so much my specific suggestions for changes that upset the GM executives but my suggesting that policies must be considered as temporary and subject to obsolescence. To the GM executives, policies were “principles” and were valid forever, or at least for very long periods. “We spent twenty years thinking through and developing these policies,” one of them said to me. “They have been tested in practice. We know they are right. Indeed the disagreement was not about GM policies but about the nature of policies altogether. The GM executives believed, consciously or not, that they had discovered principles and that these principles were absolutes, like laws of nature. Once thought through and tested, they were considered to be certain. I, by contrast, have always held that principles of this kind, being man-made, are at best heuristic—that is, ways of identifying the right question rather than the one right answer. The GM executives, for all that they saw themselves as practical men, were actually ideologues and dogmatic, and they had for me the ideologue’s contempt for the unprincipled opportunist. This by the way has been the one point on which my approach to management has always differed from most of the writers or theoreticians on the subject—and the reason perhaps that I have never been quite respectable in the eyes of academia. I do believe that there are basic values, especially human ones. I am convinced that there is a fairly small number of basic questions. There are answers that have a high probability of being the wrong ones—at least to the point where one does not even try them unless all else has failed. But the test of any policy in management or in any other social discipline is not whether the answer is right or wrong, but whether it works. Management, I have always maintained, is not a branch of theology but at bottom a clinical discipline. The test, as in the practice of medicine, is not whether the treatment is “scientific” but whether the patient recovers. When, eight years after the publication of Concept of the Corporation, I brought out the first systematic book on management—still the most widely read management treatise all the world over—I deliberately called it The Practice of Management rather than Principles of Management, even though my publisher pointed out that my title would seriously impede the book’s acceptance as a textbook in colleges and universities. And it was this basic view of management which the General Motors executives could not accept. They saw themselves as the pioneers of a science. And thus the thesis underlying Concept of the Corporation (and all my management books) that management is fundamentally a practice, although, like medicine, it uses a lot of sciences as its tools, was totally unacceptable to them. And indeed GM, immediately after World War II, returned to the policies and the structure the company had developed in the twenties and thirties and has maintained these original policies and structures ever since, with a minimum of changes. In respect to employee relations, GM executives found the approach of Concept of the Corporation and its recommendations to be worse than unacceptable. They kindled a major conflict within GM in which Concept of the Corporation and I were on the losing side from the beginning, being opposed by both the powerful United Automobile Workers Union (UAW) and the majority of senior GM executives. In the course of my research for Concept of the Corporation in 1944 and 1945, I visited every GM Division and most GM plants east of the Mississippi. When I began my work GM had just completed its conversion to war production. And there was not one plant that turned out products it had ever turned out before: GM’s main plant to make spark plugs for automobiles, for instance, had converted to making bomb sights for airplanes. All the jobs on the production floor were new. Yet engineers were scarce and experienced supervisors even scarcer. Hence a good deal of the layout and organization of job and work had to be turned over to the workers themselves, even though most of them were quite inexperienced and had often never before worked on an industrial process. I was tremendously impressed by the willingness of these green workers to take responsibility, by their ability to learn, and by their eagerness to work together to improve working methods and product quality. And so I strongly urged in Concept of the Corporation that GM base its employee relations for the post-World War II period on the workers’ desire to be proud of their job and product, and that GM, and industry altogether, consider labor a resource rather than a cost. And this has been the keynote of all my work in the management field ever since. Concept of the Corporation also first asked how a major employer could create job security and suggested that such policies as income guarantees and retirement plans be seriously studied. This made a great impression on one of GM’s most senior executives—Charles E. Wilson, then the company’s President and slated to become the company’s Chief Executive Officer after Mr. Sloan’s retirement, which was expected to take place as soon as World War II was over. Actually I did not meet Wilson [For more on this extraordinary man, see my chapter ‘Alfred P. Sloan and General Motors’ in my book Adventures of a Bystander (New York: Harper & Row, 1979)] until I was almost through with my work—he had been convalescing from a stroke for most of 1944. But he immediately made me his consultant on employee relations and put me to work on studies out of which emerged a few years later GM’s proposal for the first income guarantee in American industry, GM’s Supplemental Unemployment Benefit, and for GM’s pension plan. This proposal set the pattern for the private pension plans of business, which by now insure the retirement of the great majority of the employees in America’s private sector. Wilson established within GM an Employee Relations Staff separate from Labor Relations, independent from it and with its own vice-president reporting directly to him (for which job, I learned many years alter, he had actually proposed me). The mission of the new staff was to create eventually the “responsible worker” with his “managerial aptitude” and the “self-governing plant community” for which Concept of the Corporation had pleaded. As the first step toward these goals, in 1947 Wilson initiated—after GM had completed its conversion to peacetime production—the biggest employee attitude survey ever undertaken in American industry. Under the guise of a “contest,” “My Job and Why I Like It,” it was designed to find out what workers actually wanted from company, supervisor, and job, where they saw the major opportunities for improvement in what we now call “the quality of working life,” and where they felt themselves competent to take on responsibility for job and performance. “My Job and Why I Like It” was a huge success—more than two thirds of all GM employees took part in it, with many of the almost 300,000 entries running to long essays of twenty pages and more. It was also a veritable gold mine of information, the richest source of information ever about workers, their needs, desires, and capabilities. One conclusion came out overwhelmingly from even the smallest sample of entries: the desire of workers to identify themselves with product and company and to be held responsible for quality and performance. Or: “I like the wages and the job security. I like working for a big and successful company. Indeed Wilson, as a result of the “My Job and Why I Like It” contest, was all set to start what we today would call “quality circles” (as I remember it Wilson himself called them “Work Improvement Programs”). He had even picked out the GM divisions where the program would first be started and tested out. And then the whole program was hastily dropped. Indeed, even work on the entries of the contest was stopped and its findings suppressed. The main reason was violent opposition to the contest, its findings, and especially to anything like a work improvement program on the part of GM’s union, the UAW. To the UAW anything that would establish cooperation between company and workers was a direct attack on the union. Wilson offered to make the union and its representatives in the plant a part of the work improvement program. But Walter Reuther, the President of the UAW, and then America’s most visible and most powerful labor leader, remained adamant. If GM went ahead with its plan—even if it only continued work on the contest entries and published the findings—Reuther said the UAW would call a general strike against GM. This was just at the time when GM would least afford a strike. Automobile demand, after the stoppage of production during World War II, was at its peak and GM was launching its first truly new models, the first ones, for instance, with an automatic transmission. And in the climate of the times—the Truman years—public opinion and government alike were certain to side with the union. But Wilson might still have risked defying the union had he had support from his own management within GM. But there the approach to employee relations that Wilson had taken from Concept of the Corporation and Wilson’s entire employee relations policy were just as unpopular as they were with the UAW. And while Wilson was nominally CEO, he was not really the boss. Alfred Sloan was still Chairman and still, by far, the most powerful man in the company—and Sloan had little use for the responsible worker or for the self-governing plant community. For the great majority of GM executives—and for executives in American industry altogether at that time—anything like a work improvement program or a quality circle represented the abdication of management’s responsibility. “We are the experts, after all,” they argued. “We are being paid for knowing how to organize work and job, or at least for knowing it better than people with much less experience, much less education, and much lower income. And so Wilson was forced to give up his project—and with it the entire approach Concept of the Corporation had urged on him and on American industry as a whole. Many years later, when Wilson had left GM to become President Eisenhower’s Secretary of Defense, he told me in confidence that he had accepted the President’s offer in large part because he felt himself totally frustrated in his attempt to change American employee relations and to base them on worker responsibility for performance and work quality. But while GM paid no attention to the recommendations of Concept of the Corporation (further developed later on in my books The New Society  and The Practice of Management ) the Japanese did. My popularity in Japan, where I am credited with substantial responsibility for the emergence of the country as a major economic power and for the performance and productivity of its industry, goes back to Concept of the Corporation, which was almost immediately translated into Japanese, eagerly read and applied. And while GM paid no attention to the findings of the “My Job and Why I Like It” contest, Toyota, in the early 1950’s, somehow managed to get a copy of the unpublished findings and modeled its own employee relations on them. In retrospect it is obvious that the UAW and the GM executives were wrong and Charles Wilson right. But the GM executives who pleaded that they were being paid for worker productivity and that to hand the job over to the workers was abdication of responsibility were not frivolous, nor were they necessarily motivated by vanity and lust for power. They saw themselves as experts and management as scientific. Indeed, I vividly remember one of them—then GM’s vice-president of labor relations—arguing with me that I proposed to turn over the deterioration of the diagnosis to the patient when the physician is the only one qualified to make it, or the decision as to whether the earth is round or flat to school children when it is a matter of objective scientific reality. And, curiously enough, Walter Reuther, to whom Charles Wilson sent me to discuss the “My Job and Why I Like it” contest, took exactly the same line and used almost exactly the same arguments to justify his opposition to the proposed work improvement program. Now, a generation later, it is easy to indict the GM executives and the union leaders of 1950 for timidity, shortsightedness and, above all, arrogance. But that is the 20/20 vision of hindsight. There surely is a responsibility of both knowledge and position that should never be abdicated. And most of the so-called “experts” in modern society take exactly the same view as the GM executives and Walter Reuther did regarding their role in comparable situation. But also at the time it was by no means clear how to design and structure the responsible worker and the self-governing plant community. As both Charles Wilson and I clearly saw at the time, it would have taken ten years of experimentation. I stressed from the beginning that the concepts of the responsible worker and self-governing plant community must not be confused with permissiveness. But it took ten years or more until the late Abraham Maslow, in his book Eupsychian Management [Homewood III. : Richard D. Irwin, Inc., 1965], calling his solution “Theory Z,” established clearly that the responsible worker and the self-governing plant community require strong leadership by management, uncompromising goals and standards, and very high self-discipline. And American society in the fifties and sixties was so unready for a gospel of hard work, high standards, and self-discipline that Maslow’s Theory Z, despite his towering reputation as the father of humanist psychology, was almost completely overlooked. When twenty years later we became receptive to such heresies, Maslow’s work had been forgotten so completely that William Ouchi could publish a best-selling book in 1981 under the title Theory Z [Addision-Wesley, 1981] without acknowledging that Maslow had first developed the theory and had coined the term—indeed, without any mention in his book of Maslow and his work, of Douglas McGregor, who in the fifties had codified my concepts under the term “Theory Y,” or of me and my work. There is little doubt that the GM executives who aborted Charles Wilson’s attempt to create the responsible worker and the self-governing plant community were seriously wrong. And the labor leaders of the time may have done even more damage: they may have condemned the American labor movement to sterility, impotence, and eventual irrelevance. As for me, I have always considered the responsible worker with his managerial attitude and the self-governing plant community as my most important and most original ideas and my greatest contributions. Their rejection by General Motors and its executives, with the result that these concepts have had almost no impact in my own country—never mind how much impact they have had in Japan—I consider my greatest and my most galling failure. The most fundamental issue underlying the rejection of Concept of the Corporation by GM’s top executives was that of the public character of the private business. Concept of the Corporation treated the big business corporation as “affected with the public interest” and as concerned with matters that are definitely public rather than private. This GM and its top management people could not accept at all. They had no problem with the feature of the book that at that time gave so much offense to academic economists and political scientists: the application to the analysis of a business of such concepts of political science as structure, decision-making process, power relationships, or policy. Indeed they had invited me to study their company in large part because my background was in government and political science. GM was also among the very first large American companies to accept responsibility for the impact of its activities on community and society. It was the first one, for instance, to stagger working hours at its plants so as to eliminate, or at least to assuage, traffic jams in the communities adjacent to them. Long before anyone thought of legislating occupational safety, General Motors had instituted a “zero-accidents” policy which held supervisors and managers responsible for even the most minor accident, and which gave GM the best safety record of any American manufacturing business. In the 1920’s Alfred Sloan founded the Automotive Safety Council and remained its most ardent supporter throughout his life. He led the campaign to legislate drivers’ tests in all states. And he personally developed and financed the first driver education programs in high schools. The Automotive Safety Council, under his leadership, rather than the Federal Government or the states, also developed the standards for safe roads and safe speeds which are the main reason that since the 1930’s the United States has had the lowest automobile accident rate per passenger mile driven of any developed country in the world. But GM executives—and especially Alfred Sloan—objected to anything that would give the corporation rights, authority, and responsibility beyond its economic function. They therefore rejected out of hand the suggestion in Concept of the Corporation that their company concern itself with what we would now call “social responsibility”—for example, responsibility for the health of the cities in which GM had plants. They recoiled from such recommendations as gross usurpation of authority and as illegitimate. They knew that there is no such word as “responsibility” in the political dictionary. They had structured GM on the basic principle of political theory which lays down that responsibility always has to be commensurate with authority—and indeed this is the fundamental principle for any effective organization. For authority without responsibility is tyranny, and responsibility without authority is impotence. Also, the GM executives argued, “We find it hard enough to make and sell automobiles even though all of us have spent all our adult lives in the business. We very much doubt that we would do a good job in any other business—for instance, in running a retail chain. What then makes you think that we would have the competence for these social responsibilities? That Concept of the Corporation presented the big business corporation as “affected with the public interest” was thus an affront. It was the reason which caused GM executives to consider the book anti-GM, anti-business, and indeed subversive. Alfred Sloan in particular was so offended that he felt it his duty to rebut Concept of the Corporation. “I had thought several times of writing my memoirs but always decided against it as being too self-important,” he told me around 1960, almost fifteen years after Concept of the Corporation had been published. “But your book forced me to do the job. Sloan’s My Years With General Motors fully deserved its great success—it was a best-seller when it came out and has remained one of the key books on management ever since. I always recommend it as the best book on what really goes on inside a big company, or indeed inside any big organization—how decisions are really made, how people at the top of large organizations spend their time, and how they really behave. I find it as interesting as any novel. But what is perhaps most interesting is what is not in this book. Sloan was passionately engaged in politics from the early twenties on. He successfully managed the campaign for the U.S. Senate of an old friend, James Couzens, who had first been Henry Ford’s partner in the early Ford Motor Company and who had in this capacity engineered the famous “five dollars a day wage” in 1913, and who later became the popular reform mayor of Detroit. And in the late thirties Sloan had helped found the Liberty League to oppose Franklin D. Roosevelt and the New Deal. Yet there is no mention of any political activity in My Years With General Motors. Sloan spent endless hours on the Automotive Safety Council, on General Motors’ engineering school, the GM Institute, and with his younger brother, Raymond, on hospitals and their management. There is no mention of these interests and activities in My Years With General Motors. And on the job itself, Sloan, as he once told me, spent a third of his time or more on “outside” matters: relations with the Federal government and meetings in Washington, relations with state governments, union relations, dealer relations, and so on. Again there is no mention of any of these in the book. The book deals in great detail with GM and the automobile market during the Depression and the New Deal years, and with GM’s role in war production during World War II. But Franklin D. Roosevelt is mentioned only once and in passing. Yet Sloan knew exactly what he was doing and why. President Roosevelt was after all outside of GM. And Sloan wrote the book to present his (and General Motors’) view of the manager as a professional who has no more right to be concerned with anything on the “outside” than the physician in treating a patient has a right to distinguish between a famous and rich man and a bum on skid row. Equally important to Sloan in writing the book was the opportunity to present his view of the corporation as having authority only in its own sphere—that is, in discharging its economic function. Today, few would accept Sloan’s self-limitations. Indeed, to most people, including most American business executives, this view would appear as a major weakness and as a major cause of the troubles GM has had in the last decades, including the sharp decline in its public standing and reputation. For instance, a GM willing to accept that big business is indeed “affected with the public interest” would not have made the crucial mistake of hiring detectives to investigate Ralph Nader and his private life—a mistake that gave Nader the publicity he needed, making him into a public hero and, for a few years at least, a political power. And yet, while GM’s position has been proven inadequate by the events of the past forty years, it cannot simply be dismissed as wrong, as narrow, and least of all as selfish. It was a serious position, resting on a sound principle. It is true indeed that there can be no responsibility without authority and that those who clamor for the social responsibility of business actually are pushing business into a position of social authority and power in a great many areas, however much they may see themselves as enemies to business and opposed to its power. It is also true that institutions have limited competence and that they are unlikely to be effective if acting beyond their competence. But also no one expects anymore, as we did during the Kennedy and Johnson Administrations, that a big university should be able to give us the experts to “fine-tune” the economy or to find the answer to the ills of the modern large metropolis. We know today that GM’s position is inadequate, no matter how strong its logic. It is inadequate, however, not because our institutions, whether a business, hospital, university or labor union, have a social responsibility for public problems beyond their own function and beyond their own competence, as the popular rhetoric asserts. It is inadequate because in theory and in practice modem government has collapsed into impotence. We have a new pluralism. And like any pluralism of the past it is incapable of deciding who should be responsible for what—it only knows that there are social needs which the traditional political institution (that is, the government) cannot take care of. We know, in other words, that we do not know the answers. But we also know that to be dogmatic is the wrong answer. GM’s refusal, then and since, to accept this and to go to work on thinking through the problem, at least insofar as it concerns GM and its own relationships, responsibilities, and situations, has surely been a serious weakness and, in a way, an abdication of managerial responsibility. GM’s executives ducked the very responsibility they asserted: the responsibility for the welfare of the corporation in their keeping. Still the GM position, while totally inadequate, and indeed inimical to the self-interest of the corporation, raises questions that have yet to be answered. What has hurt GM the most is that its fundamental tenets made it smug. Alfred Sloan and Charles Wilson had been highly innovative people who always asked, “What is the right question?” Their successors knew all the right answers. By the late fifties, for instance, it should have become apparent to GM’s top management that organization structure had to be thought through anew. For the automobile boom had by then taken off in Europe, and although GM owned two major European automobile companies, Opel in Germany and Vauxhall in Great Britain, it was not organized as a multinational company but was (and still is) organized as an American company with foreign subsidiaries. Every market study—and GM had pioneered market studies in the twenties and excelled in them—must have shown GM management that the European automobile market was going to grow much faster than the American one. Yet GM retained an organization structure, a top management structure, and personnel policies which virtually guaranteed that it would fall behind in Europe. The two European affiliates did not, for instance, report to the corporation’s top management but were tucked away, a good many levels down, in an Overseas Division that was also concerned with such matters as the export of spare parts to Ecuador. GM’s top management was at the same time also the operating management for the American business, so that it never had any time for Europe. And no one in the European affiliates, no matter how well he performed, got into the upper management ranks of the parent company; no successful executive from the American business was ever posted to Europe, and no one in the company’s top management had any first-hand experience working outside of the U.S. Indeed, even visits to Europe by members of the company’s top management were so rare as to be almost unheard of. As a result, GM has dropped to fifth place in Europe, well behind Ford, Volkswagen, Fiat, and Renault. And it totally missed the substantial automobile boom in Brazil even though, before World War II, it had the leadership position in that country. Similarly, by the mid-sixties, new thinking had clearly become overdue in respect to GM’s employee relations. “All the worker wants is money,” both GM’s executives and GM’s union leaders had argued when Charles Wilson tried to develop the recommendations of Concept of the Corporation into his work improvement program. And until the mid-sixties the GM formula—"money plus discipline equals productivity”—seemed to work like a charm. But then when GM opened a new—its biggest-assembly plant in Lordstown, Ohio, the system suddenly broke down. Lordstown was the most advanced plant GM had ever built, way ahead in automation and technology. It was designed to exceed any automobile plant in the world, including GM’s own plants, in productivity and in quality. It also paid the best money. Yet discipline broke down almost at once. The new and mostly young workers in Lordstown demanded responsibility. And when they didn’t get it, both productivity and product quality went down the drain. Until then GM had prided itself on world leadership in automotive quality. Suddenly there were tales of GM cars with wrenches left lying in the gas tank, with the wrong engine for the model, with engines not connected to the power train, or with transmissions installed backwards, and so on. Both GM and the UAW treated the Lordstown workers as rebels. But Lordstown never attained the productivity it was built for and quality deterioration spread from Lordstown to other GM plants. The belief that all the worker needs is money at the same time made GM exceedingly vulnerable to union pressure for higher wages and benefits. Until the mid-sixties, GM’s manufacturing productivity did indeed rise faster than its labor costs. And if foreign competitors could undercut GM’s costs, it was because they paid sub-standard wages—that is, below the going American wage. But by the mid- or late sixties, labor costs in major European countries had drawn level with those of most American manufacturing industries, and, a few years later, Japan ceased to be a low-wage country and attained labor costs that were more or less equal to those American manufacturers had to carry. And all of a sudden productivity in GM’s plants no longer went up. It began to go down. But GM’s own convictions precluded it from relating its labor costs to productivity; productivity after all was the exclusive concern of the “expert,” the manager. And so GM had no defense against union demands for “more”—the union was after all only speaking GM’s own language. Ten years later, in the late seventies, GM then found itself with labor costs that were a good 50 percent higher than the prevailing costs in American manufacturing industry, and with productivity-per-hour-worked well behind that of its foreign competitors. By the late sixties, GM should have accepted that, no matter how logical or “pure, the dogma of the private character of the big business enterprise could not be maintained and needed to be thought through and changed. The radical shift in GM’s public reputation and esteem, to the point where “GM baiting” could become a popular and risk-free blood sport, was not the result of anything GM did or did not do. Other companies did worse or more stupid things without suffering more than temporary discomfiture and embarrassment. What turned the public against GM to the point where anyone attacking GM became immediately popular was the perception of GM as insensitive and arrogant. I am quite sure that questions and suggestions similar to those made in Concept of the Corporation were made within GM, and repeatedly, but in all probability they got the same reception which it had received a quarter-century earlier. “Don’t rock the boat.” the elders of the clan almost certainly said. Indeed, questioning GM—certainly until very recently, that is until 1979 or 1980—was questioning success. By any of the yardsticks by which GM as a “private” enterprise measures itself, it has been enormously successful following its old policies and refusing to change them. Sticking to its self-imposed limitation of providing no more than 50 percent of the cars sold in the U.S. market, GM, year after year until the mid-seventies, increased its total sales and sharply increased its profits. It succeeded in other words in obtaining an ever growing share of the most profitable market segments, and apparently with lower marketing and promotion expenses than its competitors. And none of the headlines, none of the Nader attacks, none of the laws and regulations passed to curtail the automobile and the automobile industry—most of them aimed directly at GM—seemed to make the slightest difference. No effect whatever of any of the Nader attacks can, for instance, be found in GM sales and profits. No one could have blamed GM management had it concluded that all these critics and attackers were barking dogs making a lot of noise but having no bite whatever. And even now, in 1982-83, despite very sharp drops in GM earnings, including a loss year for the first time since the worst years of the Great Depression, one can argue that GM and its policies are as successful and as valid as they ever were, at least judging by business and financial results. GM’s profits have dropped no more than those of any major automobile company (except Mercedes) and less than those of its closest rivals, Ford and Fiat. While car sales are down in absolute numbers, GM has not lost even one percentage point in market standing. What GM suffers from, in other words, is a worldwide slump in the automobile industry rather than anything unique to GM and its management. Even in Japan, where in the twenty years from 1957 to 1977 automobile ownership grew at as fast a rate as any industry has ever achieved over a prolonged period—from 700,000 passenger cars on the country’s roads in 1957 to more than 20 million in 1977, for a thirty-fold increase—automobiles sales have now been falling year after year since 1979, at a rate of 4-5 percent compound per year (which in large measure explains why the Japanese automobile manufacturers, unable to lay off workers under their lifetime employment system, are so desperately pushing export sales to North American and Europe). And none of the Japanese sales on the U.S. market has been gained at GM’s expense at all. The main losers have been another importer, Volkswagen, which is down from almost 10 percent of the U.S. market in 1969 to less than 1 percent today, and GM’s two main domestic competitors, Ford and Chrysler. And that GM has done poorly, by any yardstick, outside of North American and especially in Europe, may not bother GM’s top management unduly. It was never particularly internationally minded, in contrast to Ford, for instance. GM’s top management had indeed so little enthusiasm for Europe that in 1945 Alfred Sloan had to use all his enormous prestige and influence to get his colleagues to agree, and then most reluctantly, to return to Germany and to rebuild Opel. And also in the early seventies, just when its smugness seemed to have consigned GM to long-term decline, the company began to think again, began to ask questions and to make quite a few highly innovative moves. Even before the 1973 oil crunch GM had apparently concluded that the market needed a radically new design: a roomy, powerful, and yet fuel-efficient car. In those years the competitors went to a small car; for instance, Ford designed the Fiesta. But GM apparently concluded that the American consumer would buy and pay for a car that would give him the comfort, space, and power he is accustomed to, and yet also would give him the fuel economy of the European or Japanese automobile. And so GM started to develop the “X-Car” to be the new standard for the market. It continued the development of the “X-Car” after 1973) even though succeeding American administrations from Richard Nixon’s to Jimmy Carter’s did their level best to subsidize the big “gas guzzler” and to discourage the shift to smaller and fuel-efficient cars by keeping gasoline prices in the U.S. artificially low, thus making buying a fuel-efficient car appear as both unnecessary and un-American. GM’s “X-Car” would probably have swept the American market had the Shah of Iran only managed to hold on to his throne a year or two longer, that is until 1980 or 1981. GM’s timetable called for the “X-Car” to be ready by the fall of 1981, which meant that the Shah’s downfall in 1979 and the ensuing oil panic found GM not quite ready to supply “X-Cars” to the market. Even so, GM’s version of the “X-Car” in the light van market—which is growing faster and is more profitable than the market for passenger cars—had already, by the fall of 1982, recaptured almost all the territory which, a year or two earlier, the Japanese seemed to have taken over permanently. In the early seventies GM also started work on “robotizing” production and assembly. In contrast to the much publicized Japanese robotization—for example, that at the Zama plant of Nissan, outside of Yokohama—GM has issued no press releases, has made no announcements, and does not invite visitors to its robotized plants. Indeed, access to these plants is severely restricted and even members of GM’s Board of Directors are apparently not welcome and not allowed in. But from the few bits of information which have leaked through GM’s tight security curtain, it would appear that GM is fully abreast of the Japanese in robotizing the assembly line and may be a good deal ahead of them in robotizing manufacturing of both engines and bodies. In 1977 GM went into Japan and bought little more than one third of Isuzu, Japan’s seventh largest automobile maker. And then, in 1981, GM bought 5 percent of an even smaller Japanese automobile manufacturer, Suzuki. In terms of traditional GM policies, neither move made much sense. GM earlier had always insisted on 100 percent ownership of anything it bought abroad, or at least on complete control. And it had always bought for one reason only: to gain access to a market. Obviously it has ownership control of neither Isuzu nor Suzuki, and neither is big enough to give access to a Japanese market dominated by six much bigger markers: Toyota, Nissan, Honda, Mitsubishi, Mazda, and Subaru. But when it acquired Suzuki GM announced that it had completely changed its strategy. Instead of buying access to market, it was buying access to sources of supply, and especially to the suppliers Suzuki had developed in the labor-surplus countries of southeast Asia. Where Suzuki now makes 300,000 cars a year—hardly even 5 percent of total Japanese automobile production—GM expects by 1990 to buy 900,000 Suzuki-assembled cars, the component parts of which will be made largely in Malaysia and Indonesia. And these cars will be bought for export to GM’s markets in developed countries in North America, in Europe, and in Australia. Around 1979 GM changed its employee relations policy. It even got the union to participate, though so far with less than unqualified enthusiasm. (3) employee relations that are designed to produce eventually the responsible worker and the self-governing plant community which Concept of the Corporation first suggested forty years ago, and which Charles Wilson, despite his being the Chief Executive officer of GM, could not push through against the resistance of his colleagues in management and of the company’s labor union. Whether this strategy will work it is much too early to say. But it will certainly produce a very different General Motors. What then is the GM of 1990 likely to look like? GM might again be a very profitable company. But even if its strategy works completely, GM cannot possibly become again the pioneer it was in the twenties and thirties. One cannot be the pioneer and the pacesetter if one’s industry is stagnant. And the automobile industry of the developed world—North America, Western Europe, and Japan—is bound to be a stagnating rather than a rapidly growing industry. The markets are saturated even in Japan, where automobile ownership now approaches U.S. levels. The automobile market in the entire developed world has become a replacement market. Demographics in all developed countries are such that a demand cannot rise substantially, no matter how good economic conditions are. For demand for new cars in a replacement market is a direct function of the number of young people who reach the age at which they can get their driver’s license for the first time, and in all developed countries this number is going down and cannot possibly go up again until seventeen years from now, that is, until the year 2000. This is because all the babies who will reach driver’s license age between now and the year 2000 have already been born. However successful its strategies, GM will thus be m a defensive position for years to come. But it may become the leader in automating the traditional manufacturing industries and thus in restoring the capacity of highly developed countries to compete in cost and quality against the abundant low-wage, low-labor supply of the Third World. GM may, within a decade, develop into a true transnational company that integrates the markets of the developed world and their purchasing power with the labor resources of the Third World, and does so not by ownership control, as the traditional multinational did, but by control of design, marketing, and quality, and through production sharing. And while it is much too early even to guess what GM’s labor relations will look like, the assembly line, that symbol of industry during the first half of the century, will, by the year 1990 or the year 2000, probably have faded into history.